Cancer is a bully. When it pushes its way into your life, you cannot ignore it. Cancer has touched my life, as it has many people’s lives. I was diagnosed with Hodgkin’s Lymphoma in 2002. In the years I have been working on this book, gynecological cancers affected four members of my family, and a dozen or so more members of my extended family have been affected by cancer. It is a subject that people don’t like to think about, but it is also a large part of so many people’s lives. Lara has cervical cancer. You are also a cancer survivor. Was Lara’s experience based on your treatment experience? Lara’s experience is only tangentially based on my own. I was diagnosed with Hodgkin’s Lymphoma, a blood-related cancer, in 2002 and lost much of that year to treatment. I was far more ill than Lara is, yet I had far more support. I was a 34-year-old mother of two young girls when I was sick, so family surrounded me the entire time. My parents and my husband’s parents took excellent care of my girls and me. Lara was completely alone. Although her cancer is a metaphor for Lara’s history of sexual abuse destroying her from the inside out, I wanted Dale to literally give Lara cancer. Cervical cancer is one of the few cancers that we know can be caused by a virus. Currently, young people are being immunized against the HPV virus that can lead to cervical cancer developing years later. It is one of the few cancers that can be prevented in such a straightforward way. Cervical cancer is also one of the few cancers that oncologists can successfully cure if detected in an early stage. I wanted Lara to be treated and walk away from the Cancer Center confident that she is cancer free. You deal with some heavy topics in this book – cancer, sexual abuse, and neglect. How did you keep the story from becoming maudlin? Lara’s work life allowed me to bring a bit of comic relief into the story. I enjoyed creating the character of Vanessa, with her bright colors and sassy attitude. 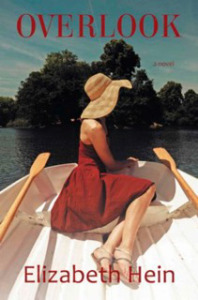 Letitia also lends some lightness to the story. Most people have had a terrible boss somewhere along the line and can relate to Letitia’s minions on the eighth floor. Also, I wanted the reader to remember that Lara is very good at what she does and enjoys her work. She does not always enjoy the people she works with, yet I hope the reader can see that her poor working relationships at the beginning of the book are largely due to Lara’s inability to connect with her co-workers. At one point in the story, Jane rails against the “pink ribbon brigade.” What was behind her attitude? As a cancer survivor, I have developed a bit of a chip on my shoulder about the type of attention breast cancer gets in the media. Breast cancer is a serious disease that takes too many women’s lives every year. There is nothing pink and sparkly about it. Also, I feel that the general public thinks that all cancer treatment is like breast cancer treatment; not true. Each type of cancer is treated with different protocols and each individual is treated differently within those protocols. The medical community is making huge strides every year to treat cancer. Still, people like Jane have little chance of surviving their cancers. There is nothing pretty about that. What was your inspiration for Lara’s story? When I sat down to write about Lara’s journey, color played heavily in the way I saw her. Her movement through the series of color-coded waiting rooms was the first image I saw in my mind’s eye. The idea of the colored tile paths snaking through the hospital developed from there. Another scene that appeared in my head during the writing process was the scene in Lara’s bedroom. I could see Lara lying on the floor with those frilly pink dotted-swiss curtains and ruffled bed skirt in the background as if I were actually there. I liked the juxtaposition of pink; a color that means feminine happiness, with the horrible things that went on in that back bedroom. From there, I echoed the girlie pink color in Dr. Lander’s offices, where awful things also happen. In the revision phase of the manuscript, I made a point to amplify the use of color throughout. Vanessa, a veritable parrot of a character, enters Lara’s life as a foil to Letitia, who is always wearing black. I also played with color as a symbol of renewal and hope in the scenes where Lara changes her hair and goes shopping with Jane. Why the Eiffel Tower? 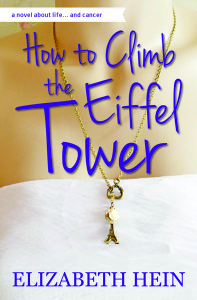 The book is titled How to Climb the Eiffel Tower but the tower itself doesn’t really appear in the book. What does the Eiffel Tower represent? The actual tower serves as a metaphor for aspiration and effort. When the two main characters meet, they talk about how Lara Blaine climbs the Eiffel Tower every Tuesday on the stair stepper at the gym. Jane Babcock-Roberts replies that it is more fun to climb the actual tower in Paris. This short conversation is the beginning of a rich, life affirming friendship. Throughout the novel, the two women return to that conversation as a touchstone of their relationship, and the tower serves as a reminder of Lara’s upward journey.